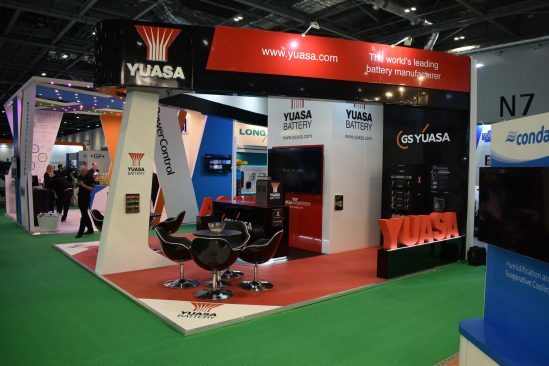 GS Yuasa Battery Sales UK Ltd enjoyed another successful year at Data Centre World at Excel, London on 12 and 13 March. The world’s leading battery manufacturer not only launched an innovative new Uninterruptible Power Supply (UPS) battery temperature monitoring solution at the event, but also welcomed hundreds of visitors to their eye-catching stand. The leading Data Centre exhibition was the first time the new Yu-Power Wireless Battery Monitoring Solution, which consists of the Yu-Power YPCBM2 Battery Temperature Logger, the Yu-Power YPCBL2 Battery Temperature Logger USB Wireless Receiver and accompanying dynamic software, was on show to the industry. The Yu-Power battery monitoring package was demonstrated on a special LED lit battery system consisting of SWL750FR batteries. The system’s accurate temperature and voltage monitoring capabilities, and the features of its powerful analytical software were displayed next to the cabinet on screen. By continually monitoring key parameters, the Temperature Logger and Wireless Receiver work together to measure temperature and voltage, communicate wirelessly and determine if a battery system is operating within recommended guidelines. 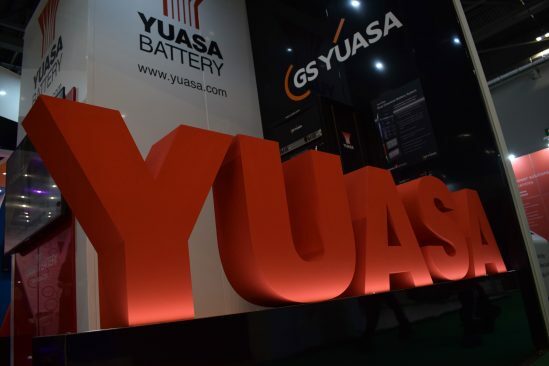 Stephen Wheeler, Sales Manager – Reserve and Renewable Power Division at GS Yuasa Battery Sales UK Ltd said: “This year’s Data Centre World exhibition was a great success. The Yu-Power Wireless Battery Monitoring Solution generated a lot of interest and plenty of Yu-Power YPCBM2 demonstration kits were given out, allowing businesses to try the solution for themselves by connecting the temperature loggers to their existing battery systems. “Data Centre World is always an important event for us. As ever, the team enjoyed showcasing examples of our market leading products and discussing the characteristics of Yuasa’s high-quality VRLA industrial battery ranges with the industry. 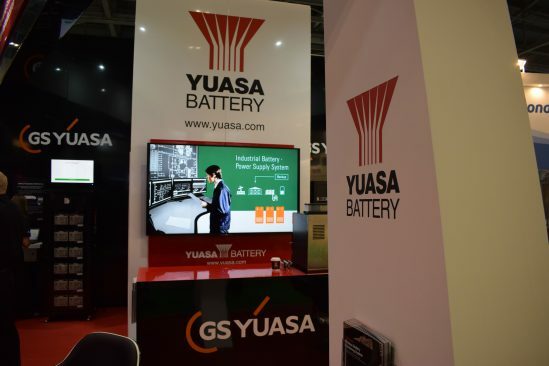 Yuasa also exhibited its dual chemistry battery system at the event. 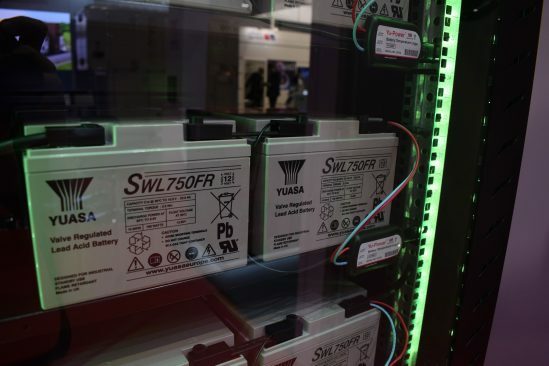 Designed to utilise the best of both Lithium-ion and Valve Regulated Lead Acid (VRLA) battery technology, the system contains 12 GS Yuasa LIM50EN-12-F2 Li-ion high energy modules connected in parallel with FXH VRLA types to the same DC bus of a UPS. Visitors to the stand also enjoyed complementary hot and cold beverages and cold snacks whilst they received technical product advice from knowledgeable Yuasa engineers and sales managers. As the world’s leading battery manufacturer, and a key partner to many high-profile, successful data centre installations across the globe, GS Yuasa batteries feature the latest technology and provide total assurance for all standby and cyclic applications. They are used in deep sea submarines, the International Space Station and a wide range of applications in between. GS Yuasa work with customers to provide the optimum standby solution for their individual project from planning through to installation.